Looking for the perfect Isle of Skye itinerary to include in your Scotland Road Trip? Are you there for a day, a weekend or longer and want to do what you HAVE to do and what's a bit…meh. Fear not- I've got you covered. During our road trip of Scotland, we stopped for 2 days on the Isle of Skye. The below itinerary is basically what we did (although we didn't do a lot of the hiking due to horrible weather!) I've also added in some new places I only heard about after our trip- guess we'll just have to go back! In my opinion, the BEST way to see Skye is with your own vehicle. There are so many stunning spots to enjoy- you don't want to be tied to someone else's itinerary. Having said that, if the only way you can visit is on an organised tour or if you need to take the bus/ train then go. It's too beautiful to miss. When is the best time to visit Skye? Is Wild Camping allowed on Isle of Skye? READ MORE: Want to learn how to find wild camping spots? How long should you spend on the Isle of Skye? Heading to the Isle of Skye? Want to learn to take INCREDIBLE photos like this? BOOK an AMAZING photography course on the Isle of Skye NOW! More things to do on Skye! If you don't have your own vehicle, I highly recommend hiring a car or campervan for a few days so you can be in charge of your own adventure. You really won't regret it. Another option is to arrive by train. Trains connect up to the ferries, so you can get across to the island pretty easily. Catch a bus into Portree and take buses around the island! The Caledonian Macbrayne ferry runs from Mallaig (mainland Scotland) to Armadale on Skye. It takes about 30 minutes to cross. I'll be honest, you should expect rain whenever you go. You should also expect midges. Anytime from April- November should be snow free. It's warmer in the months of August and September, but try to avoid August if you can as that is the UK's main school holiday. Having said that, we went in July. It rained constantly and there were HEAPS of people. Out of high season is much quieter, but the days are shorter and the weather is more likely to be cold. Still, if you go prepared, you could enjoy some beautifully crisp and clear days with spectacular views. Be sure to click on the Isle of Skye section (top left), or why not explore all our road trips from 2017 and 2018! Click the square in the top right corner to see more. The 2-day Isle of Skye itinerary is in blue (day 1) and purple (day 2). If you see other colours on the map those are our stopping places from 2017 (red & orange) and 2018 (blue & green). If you click the square in top left, you can uncheck those road trips so you just see the Isle of Skye itinerary. When we visited, it was our second ever trip with our motorhome. We stayed at the Glenbrittle Campsite, and it was beautiful, right on the shores of the loch. Just a word of caution- the drinking water had been contaminated when we went (a dead sheep or something!) so make sure you fill up before you arrive, just in case! The only problem with Glenbrittle is that it is a long way out from the main ‘loop', so if you're tight on time you might want to stay closer to the action. Portree is the main town and there are several campsites nearby. If you are going out of season, you may prefer to wild camp- we will definitely do this next time! Skye gets VERY BUSY during summer and you will probably have people around you until nightfall, sometimes even later if they are photographing the evening sky. The winds on Skye can be very strong and most of the places we saw are very exposed. I know several people who moved their van in the middle of the night because it were rocking so much. There aren't millions of parking options, so my advice is to find somewhere by 6pm ish and if you think it's too exposed, move on and find somewhere else during daylight, not at 2am in the morning! Many of the sites are more suitable for campervans, instead of motorhomes (especially if they're pulling a trailer like us!!) Turning around can be difficult and it may be a sloping parking area. Do your research carefully and read the reviews of people who have gone before. A lot of this depends on how long you have! On our 10-day tour of Scotland, we spent 2 days in Skye. We were going to stay for 3, but the rain was so heavy we ran away up to John o'Groats! Many tours/ groups start their day at the Old Man of Storr, so you have a choice. You can either get up early and aim to be at Storr by 9am (8.30 is even better) or do the loop in the clockwise direction, so go against the flow of traffic. It's entirely up to you, but for convenience let's pretend you're an early riser and go to Storr first. Leave Portree on the A855 and head up towards Storr (well-signposted). On the left, you'll see a small carpark for the Bride Veil falls. If the weather is nice and you've got time, it's worth a stop and a photo. The carpark is about 6.5 miles out of Portree, but it's not big, so be careful if you're in a motorhome (you'll notice a theme with this!!) People also seem to block others in without much thought, so take care how you park. It takes about an hour to hike to the rock formation, or 40 minutes to a plateau a little below where you can still get incredible photos. TOP TIP- if you can't see the rocks from the car park, or if you're being blown off your feet as you get out of the car, don't even bother! It's beautiful, but needs a nice day to do it justice. About 5 miles further North on the A855 are the Lealt Falls. You have to drive past them to get to the car park. Amazingly, this car park is actually fairly sizeable! Trollstigen Road- The BEST Motorbike Road in Norway! In spring and summer, these falls are surrounded by greenery and look amazing. It's about a 30-minute climb down to the foot of the falls, or you can just take photos from the top. This is one of the few places in Skye where you might not find any crowds! From the car park it's about a 2 hour round trip, but the scenery is beautiful and well worth a stop if you didn't hike all the way up to Storr. I'll be honest, we only stopped here because we saw a car park full of buses and cars and figured there was something worth seeing! It was so windy that Jade almost got blown away, but at least it wasn't raining! Apparently, there's normally a bagpiper during summer… he was nowhere to be seen when we visited! The falls are pretty, and the water at the bottom was so clear we could see the rocks, even from the top of the cliff, but honestly, we preferred Lealt Falls. Mealt Falls- it's on every Isle of Skye itinerary, but is it worth it? If you're going to do one hike in Skye, this is the one. I have no idea how to pronounce it, but that doesn't seem to bother anyone! It's not difficult, except in high winds, and the views are incredible. A round trip should take about 2 hours, but you'll be wanting to stop every 2 minutes to take photos, so allow at least 3. If you don't want to hike, walk 15 minutes up the trail from the car park. You'll be away from most of the crowds and can enjoy some of the views across the Island. I'll be honest, there's very little to see across the top of the loop. So get back in your vehicle and drive for the next 10 miles (30 minutes) or so. Alternatively, there are some beautiful wild camping spots up here, so if you have extra days, now might be a good time to stop for the night. It's time to find the Gold Cave! I'll be honest, we didn't see this when we were in Skye- hadn't even heard of it then (I found it on this blog post), but I'm adding it in so you can find it for yourself! I've marked it on the map for you. Parking is outside a farm at the end of the nearest road. Then go through the field and left at the fence. Follow the cliff along until you see a small trail leading down to the rocks below. Walk along the rocks to the right and eventually you ’ll find the Gold Cave. The walk takes about 25 minutes, so plan to take an hour for this trip. This is one of the biggest waterfalls on Skye, but sadly it's really tough to get to. Parking is virtually non-existent, especially for a motorhome. You want to park up just North of Uig (near the river if possible.) There's a small track on the right-hand side of the river- apparently, there used to be a sign but we couldn't find one! It's about a 5-10 minute walk, so not far and they are worth the effort if you can park up! Some people say this is the best place on the whole of Skye. For us, the weather was miserable so we didn't see it at its best! It's next to Castle Ewen- but don't expect an actual castle- it's just a rock outcrop. There are also several stone rings. Fairy legend says you need to sing a song to the faeries as you enter the spiral, and then walk backwards out of the spiral without touching the stones, and then your deepest wish will come true! Can you spot a fairy at the Fairy Glen? Well, that was a busy day! Depending on how long you took to hike, it's probably around 6.30/ 7pm now and you're in need of a decent meal. Portree is the biggest town on Skye and it's used to hungry visitors. There are several pubs, restaurants and shops which should still be open. Portree- the hub of your Isle of Skye itinerary! This is a ‘pick and mix' kind of day. You can hike, or you can drive around and see places- but you're unlikely to be able to do everything on this list all in one day. Here's a rundown of the places we liked- you can see them on the map and make your own choices. Dunvegan Castle is still intact and one of the few castles to be lived in by the same family for 800 years! Personally, I thought it was like most other castles in UK inside (although if you haven't been to any, it's a good one to visit) but the gardens are beautiful and well worth a walk around. The castle is open from 01 April until mid-October and 2019 prices are £14 for an adult for castle and gardens or £12 for gardens only. They also do boat rides out to see the seals for £9.50. We didn't go (due to the weather!) but it's definitely something we would like to do next time. This is by far the most popular castle on Skye, and for that reason it can be VERY crowded, especially if it's raining; this is one of the few places on Skye which allows you to stay indoors for a while! If you don't want to visit, drive past it, park up and walk back along the beach to get a picture perfect view. This is the beach which was featured on Netflix's Outlaw King (nooooo, I definitely did not watch that scene on repeat. In slow motion…!) The beach is beautiful and full of tiny coral flakes. It's about a mile from the car park, so only go if weather and time permit. Coral Beach on the Isle of Skye- who knew the beaches were so blue! Normally, I'm not a fan of museums. I get a bit bored. But this was actually really interesting. It's the only operating tanning factory in the United Kingdom and you can see the whole tanning process from start to finish. (No, I don't mean sunbeds….!) A visit takes about 1.5 hours and tours are free. You can even buy a souvenir if you like! This is the oldest inn on Skye and their fish and chips are legendary! They also have 130 malt whiskies in stock (which is a shame if you're driving!) A perfect stop for a warm welcome and a little refreshment before you set off again. This is the most westerly point on Skye, and the views are spectacular (hopefully!) This is the best place to catch the sunset, although be prepared to share it with a lot of other people, (which is why I actually prefer Talisker Bay Beach). There is a car park here and also places for wild camping, so it's a great place to end your day. The lighthouse is a little rundown and not partiucularly impressive, but don't let that stop you enjoying those views! This might be controversial, but I thought the Fairy Pools were over-rated. Sure, in the sunshine they can look stunning, and if you're really brave you can swim in them (although the water is FREEZING), but like many famous places there are too many people and honestly, it wasn't worth the hour walk each way. For me, there are prettier places on Skye. Still, if you'd like to visit, get there EARLY! Seriously, you won't believe how busy this place gets. If you're not staying at Glenbrittle, it's well sign-posted to the pools and takes about 35 minutes from Portree. If you're parking a motorhome, BE CAREFUL at the pools. Parking is tough in the car park if it's already full and there's not much space to turn around. You shouldn't park on the road as it's a single-track lane and parking can block the emergency services if they need to get through. There is parking on the left about a quarter mile before the pools- this is probably the best place. Fairy Pools on the Isle of Skye- is it worth the trip? As beaches go, this is pretty special. If you can't get to Neist Point for sunset, this western facing beach is a good second. But it's a long drive out for a beach, and you'll see plenty of others during the day, so if you're tight on time feel free to give this a miss. It's about a 30-minute walk, but the trail can be very muddy- you have been warned! Normally, I'm all about the castles, but honestly, this one is missable. It's a lot of ruins falling into the sea and, while I'm sure it was once an impressive building, it's just not that exciting anymore. Still, it's a fun place for kids to let off some steam. This incredible hill (mountain?) range is beautiful to look at and even prettier to walk in. If your legs are still going and you want to capture some stunning views, a hike here is just the thing. This spot on the south-west corner of Skye is often overlooked, but it offers the most incredible views of the Black Cullins. Elgol- missed on many Isle of Skye itinerary lists- but such a beautiful view! Edinbane Inn- each Sunday (and possibly mid-week) this Inn provides live traditional Scottish music. There may even be dancing! So what do you think? 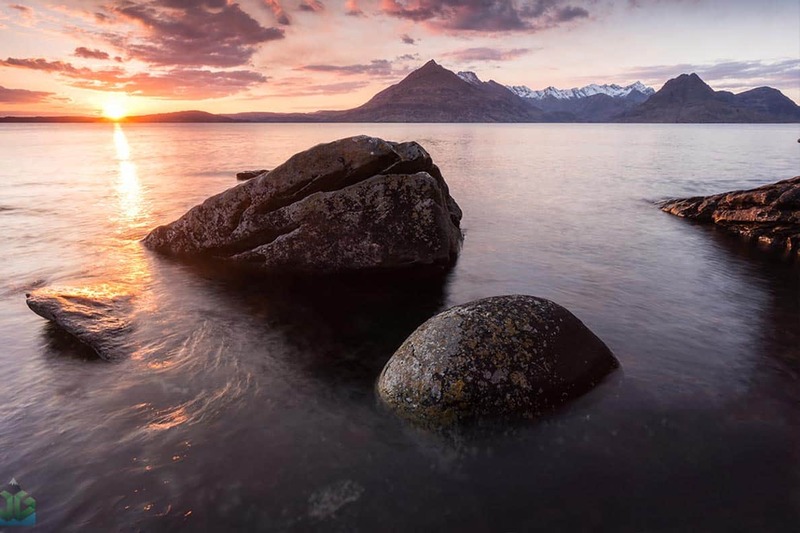 Are you inspired to visit Skye? Would you like to do this Isle of Skye itinerary?? Which is your favourite place to visit on Skye? Thanks! Great itinerary – we are going to Skye next week so finding this was very timely! Looking forward to seeing some of these great views!